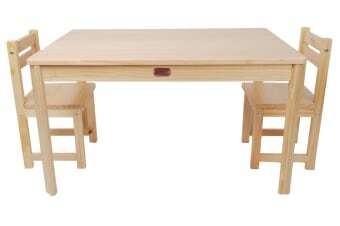 Constructed from exceptional quality New Zealand pine, this wooden table and chair set is the perfect addition to any child’s playroom or bedroom. Perfect as an artwork station or even as a children’s dining table, this versatile table is not only multi-functional but looks great! The timber surface features a glossy varnished finish that provides a protective layer that smooth to touch. Built to be extremely sturdy and durable, this table is also strong enough to support the weight of a grown man so you never have to worry it breaking!